After I refinished the cabinet in our bathroom, I began shopping for new hardware. I searched online and in stores nearby, trying to find hardware that I liked that would fit our budget. Even basic knobs would have cost me $15 to purchase, more stylish knobs run upwards of $30 EACH. That’s just crazy. Of course, Anthropologie had some beautiful pieces too but they were obviously out of our budget. 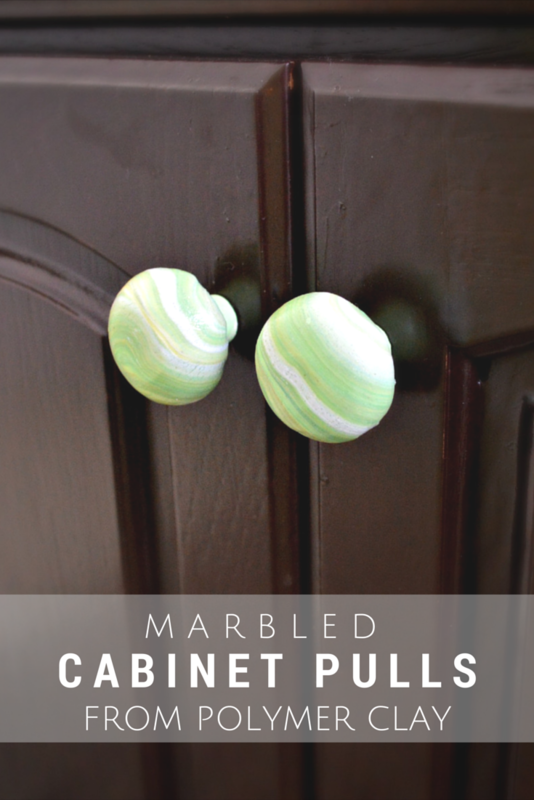 Watch this short video to see how I turned our generic drawer knobs into marbled beauties. Be sure to subscribe to my YouTube channel for creative videos twice a week. 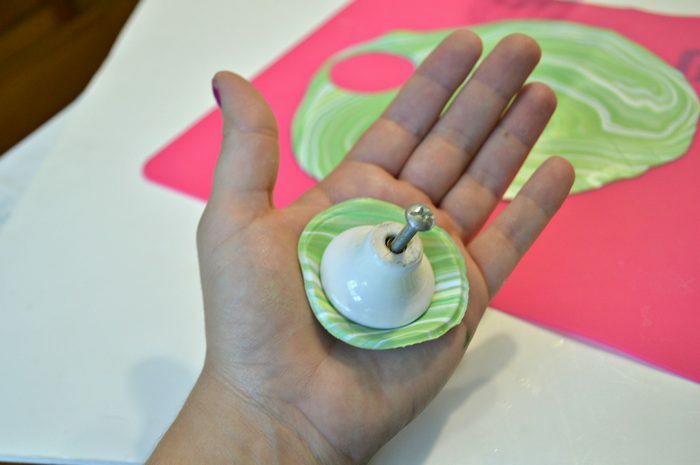 I did some research on DIYing drawer pulls and found a great tutorial on Curbly for making faux stone knobs with clay. 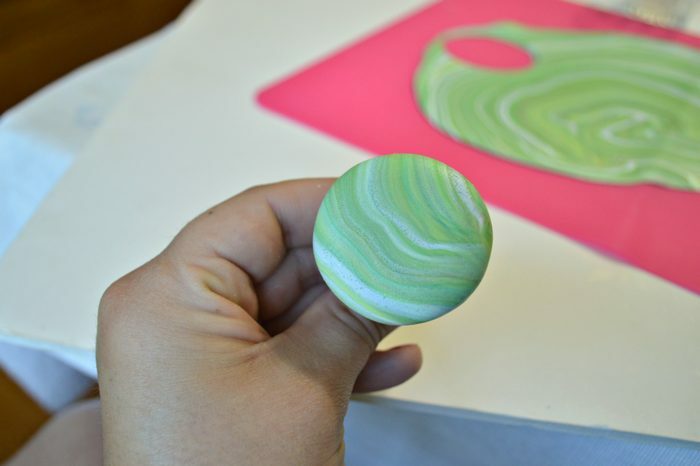 I used a version of their technique and my Anthro inspiration to make some pretty marbled drawer knobs for almost nothing! 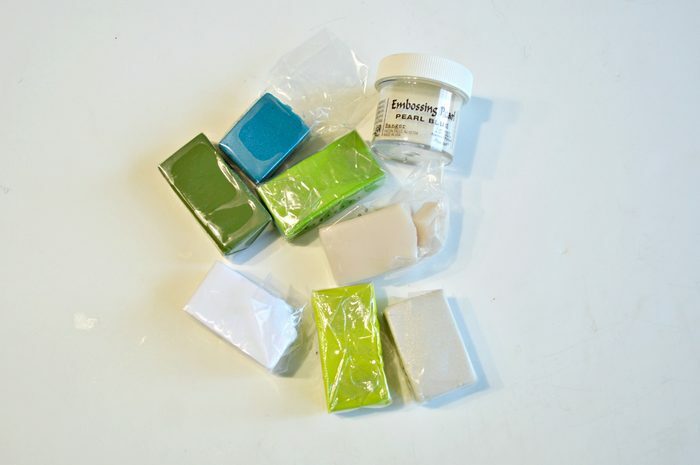 I began by gathering up any polymer clay I had leftover from my Faux Geode Necklace and Miniature Sweets that worked with our bathroom colors. 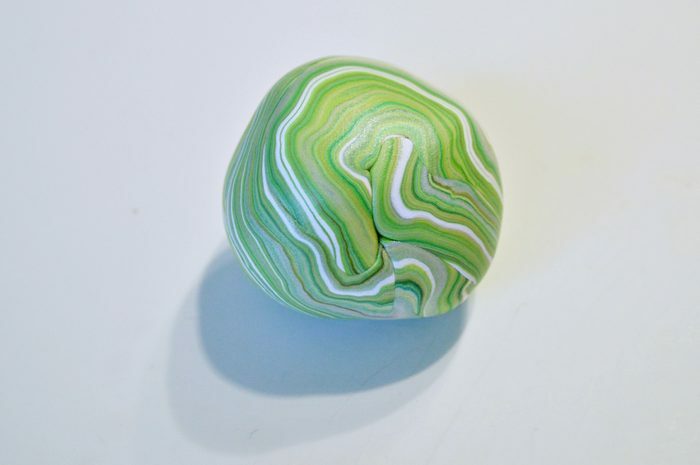 I was shooting for a cross between jadeite and marble, so I was sure to focus mostly on green colors. 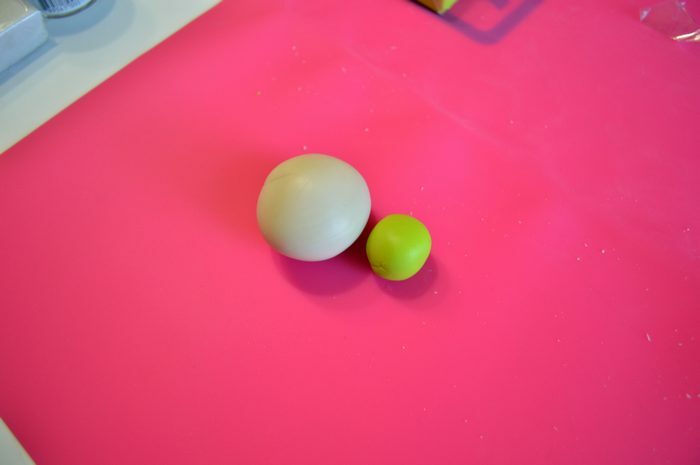 I conditioned an almost whole 1 ounce brick of translucent clay and a small amount of Premo’s Wasabi. You can see that I am working on a silicone mat. It’s definitely not a necessity, but it makes rolling and lifting the rolled clay much easier later. 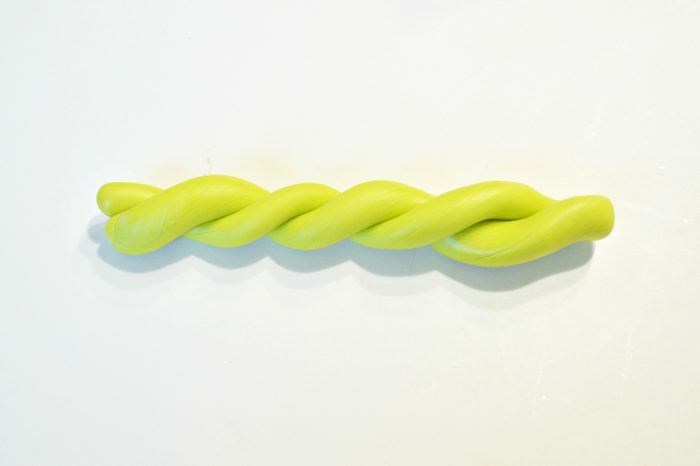 I worked the translucent and wasabi clays together, twisting and doubling back on itself, until the two colors were mostly combined. 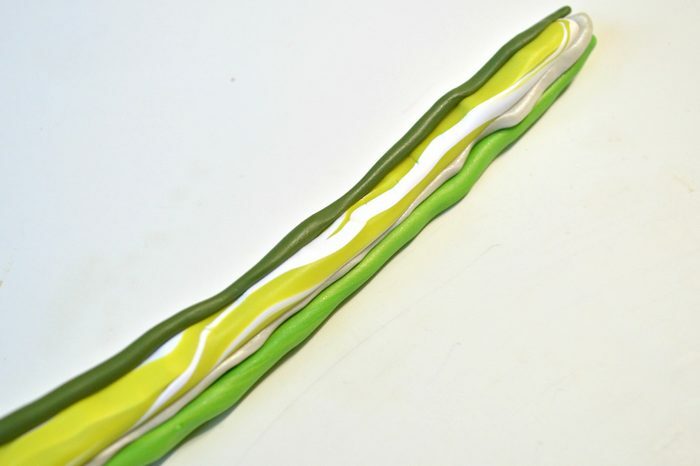 Then I rolled out varying sized snakes of Bright Green Pearl, Spanish Olive, White, Pearl, and Turquoise clay. I rolled the clay all together and rolled and twisted and double the clay back on itself. I wanted a good marbling of colors, without muddying them together. I also added some pearlescent embossing powder to the clay. I am not sure whether it made a difference in the finally product or not though. 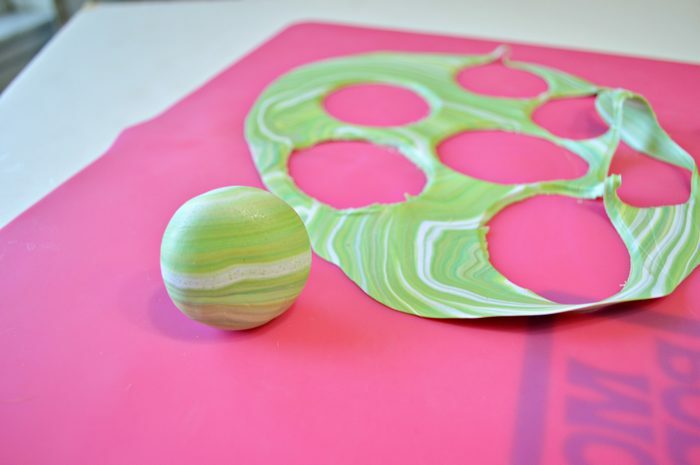 After working the clay for a while, I rolled it up into a large ball. You can see all the striations of clay really well here. Next, I took a brayer (not a real claying tool, but it works) to roll the clay out on my silicone until the clay was about 1/8” thick. Next I cleaned off the ceramic knobs I picked up at a thrift store. You can use your existing hardware, as long as it isn’t plastic. 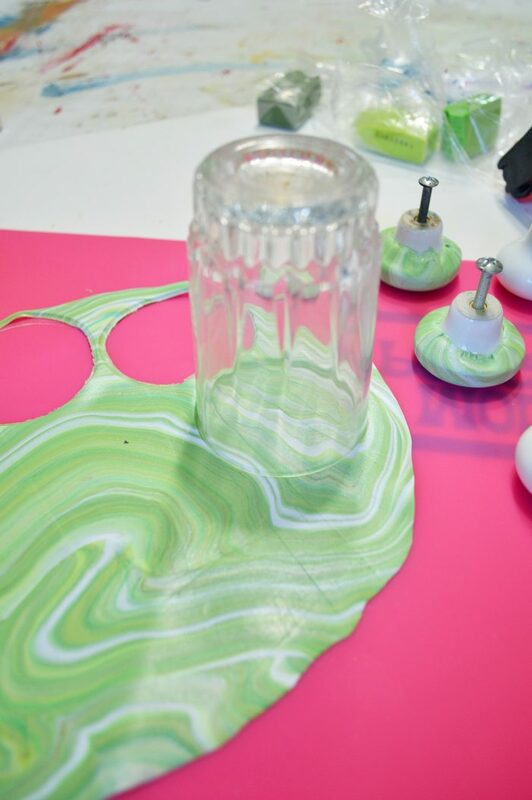 I used a juice glass that was wider than my drawer knobs to cut out circles from the rolled clay. The mat made lifting the circles up a breeze. I put the clay in the palm of my hand and pressed the knob into the clay. I worked the clay around the knob until it covered the main grippy part of the knob. I tried not to push to much on the front of the knob with my fingers, so I wouldn’t leave visible fingerprints. If I needed leverage to secure the clay, I set the knob on the table and pushed down. Keeping the screws in the knobs made them easier to handle too. That way I ended up with a smooth surface on the front of the knob. After I had cut the clay and added it to all my knobs, I put them in the oven at 275 for 30 minutes. After removing the knobs from the oven and letting them cool, I gave them two coats of outdoor Mod Podge. 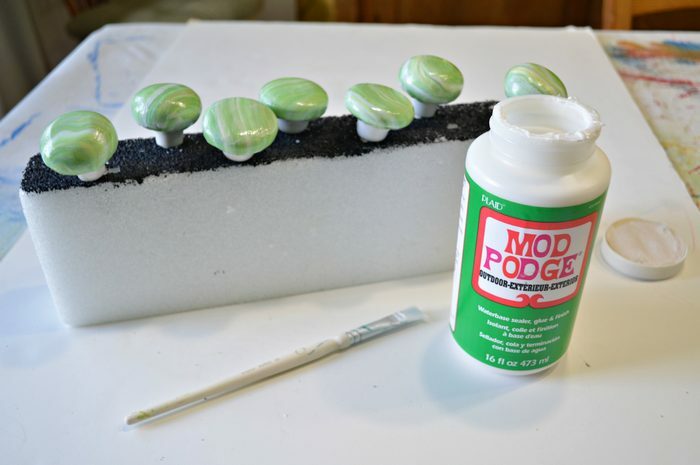 Since the knobs would be in the bathroom, I needed to use a waterproof Mod Podge formula and the outdoor fit the bill. You could also use clear sealant spray or polycrylic. Pushing the screws into a slab of styrofoam made it easier to seal the knobs without handling them too much. 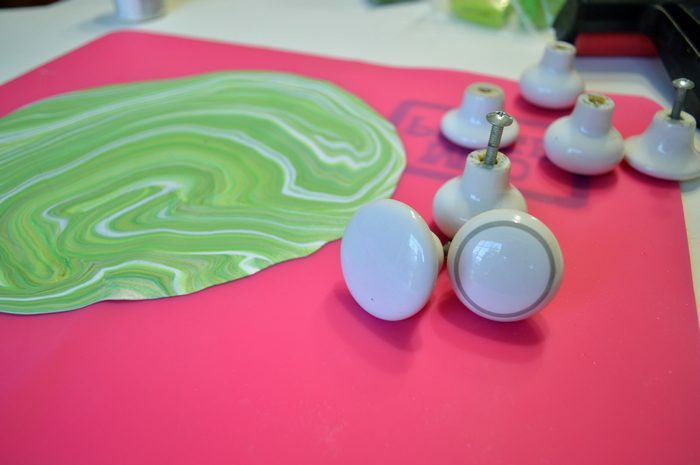 I think these drawer knobs are so pretty! 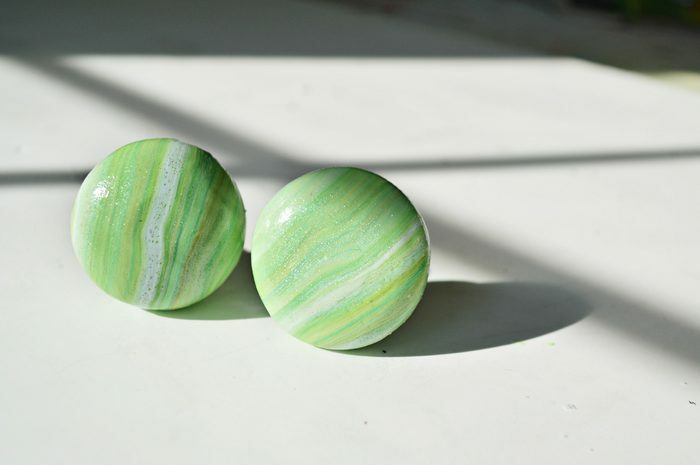 The marbling is very natural looking, and they have a slight shimmer from the pearl clay. I saved SO much money by making my own cabinet hardware, and now I have drawer knobs that are one of a kind. 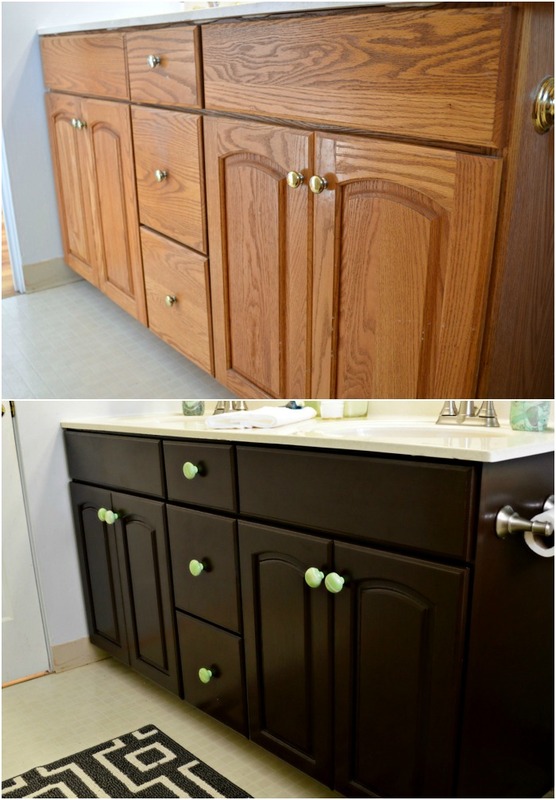 Can you believe the difference that the gel stain and new hardware made to the cabinets? It makes such a dramatic difference the bathroom! I’ve gathered links to the materials I used in this tutorial. If you purchase after clicking one of these links, I will receive a small commission. Thanks!